If you're coming out of Stockton, take Hiways 12 or 26 to Valley Springs. At the 4-way stop in VS, continue on 12/26 toward San Andreas. After about 1/2 mile after the 4-way stop, you'll see a sign on the right for Lime Creek Road. Take that about another 1/2 mile and turn right on S. Petersburg. This road will wind around for a couple of miles, and you'll turn in to Oak Knoll campground on the left. In the winter, you won't turn into Oak Knoll- you'll continue up the road maybe 1,000 feet to Acorn East campground, also on the left. Pull off the main road, stay to the left and you'll enter a large parking area. Beware, there have been breakins (although few), so leave your valuables at home! When you're ready to ride, go north thru the break in the gate that heads towards Oak Knoll Campground. You'll see some trails when the tarmac ends, follow these and the road to campsite 17 at the southeast end of the campground. That's where the trail officially begins. Keep an eye peeled, as the trail takes a couple of tricky left turns. If you don't make these, you'll find yourself on the intermediate trail that is just above the lake. You want the harder trail, doncha? We're working on getting more signage so it will be easier to follow the trails. Right now, some of the trails aren't named, so it makes it harder to find where you want to go. I repeat, we're working on it! If possible, find a friend who's already been. This is sticky. I'm sure there's a better, quicker way than this, but as of now, this is the only way I know how. You might be wise to consult a good map and shave some serious time. (Hint: Latrobe Rd., off 50 at El Dorado Hills is one way). Anyway- Highway 99 South out of Sac, to 12 East out of Lodi. Go to 88, turn left on 88, and continue straight when 88 turns left and 12 continues. Head on towards Valley Springs (see directions from Stockton for the rest, please). Also, MapQuest link below. 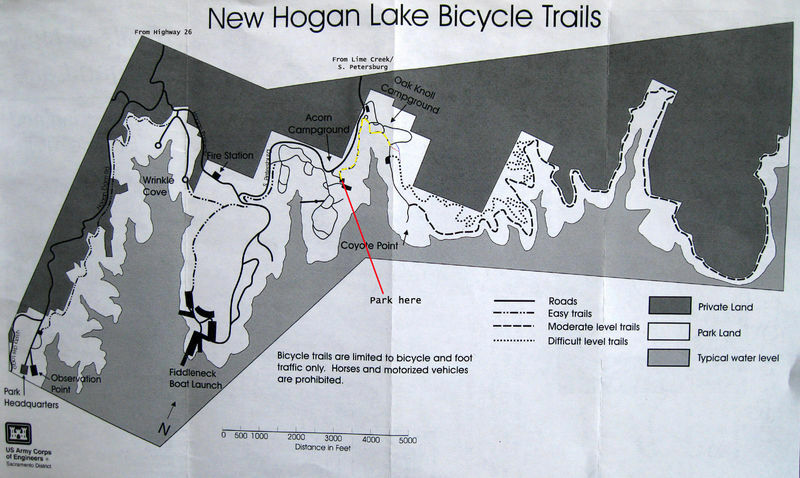 Hogan is known for its great fishing, and cheap boat launching fees. Even if you don't mountain bike, it's worth checking out for the other types of recreation. And it's not really crowded in the winter, even tho the weather is relatively mild. We will sometimes go to Hogan when the weather is bad in the valley, get up there and it will be gorgeous, short-sleeve weather. "Gary- looks like they are dumbing up the Hogan trail again, at least they are not touching the upper trail before the rim trail hits it. The real bad news is that it looks like they are putting in a fence along the property line of Mine Shaft cove. Fence material is already there; they were working on it yesterday(Sunday). A few fun parts of the trail will be cut out but it looks like new sections have already been flagged. Let me know if you know anything about this." (2-18) Boy, you've sure got that right. We went out last weekend, and in Mineshaft Cove they've started to put up fencing- either to keep cows off the trail, or to keep mountain bikers from going 10 feet into private land. The trail that used to go directly in front of of the mine has been rerouted, and now widely skirts the mine with a sterile piece of singletrack that has no pucker factor whatsoever. (2-28) Heard from Ranger Roy yesterday. He explained that the City of Stockton is selling Hogan property they've held onto for decades, and some of this property is directly adjacent/on the trail. The fencing is needed to keep us from going onto what will be private property at some point. The trail is being rerouted/realigned in several spots (they're about 1/2 done w/ the work in Mineshaft Cove, he said), and has already been rerouted so people won't be "attracted to the mine." Roy wishes the Army Corps of Engineers could buy the property, but it would literally take an act of Congress to get the $$ needed. I asked Roy if this means houses might be built up to the trail, and he didn't think so, due to limited road access. A question I didn't ask was (hey, I was at work when he called, ok? )- why would anyone want this property if they couldn't get to it? Hmmmm.